Independent inspections help assure you get the value and safety you are paying for. Did your home come with a warranty? Check it out before it expires! Don't be intimidated by professional builders, developers or warranty companies We only work for you!! Just ask our many satisfied clients. All homes benefit from independent inspections. Some general contractors will cut corners knowing that municipal inspections are rarely complete, and push their subcontractors to get it done as fast as possible. This is especially true in large developments where a workers jump from site to site, missing the critical details, or taking the time to alert others of problems they find. The following 2 pictures were items we found in a brand new home we inspected before the owner took possession. This had passed all its municipal inspections, but clearly the building inspector didn't check any of these problems. During this inspection we noted low air flow to the heat registers. 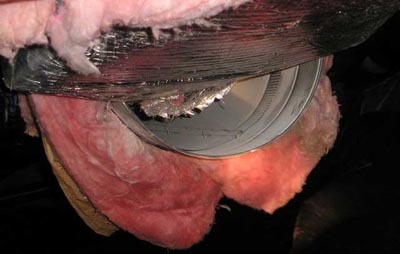 This is the main heating duct under the home. This was blowing precious warm air into the crawlspace. I doubt that heating contractor left this ductwork in this condition. Surely he was not the last worker in this space. I am sure this buyer was glad we caught it, his gas bill would have been terribly high trying to heat the home by warming the crawlspace. 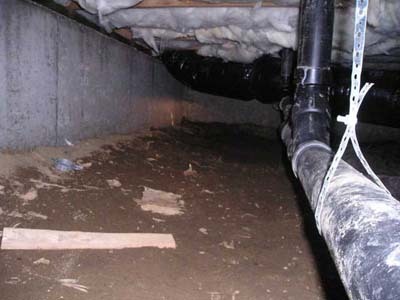 Vapor barriers (Usually plastic sheeting) are critical to moisture control in the crawl space. During this inspection we noticed saturated, heavy clay soil. Water does not percolate like it does in sandy soil. In this crawlspace, all of the soil was damp. The lack of a complete vapor barrier and leftover wood construction wood debris are conducive conditions for wood destroying organisms,( ie. beetles, ants or termites.) 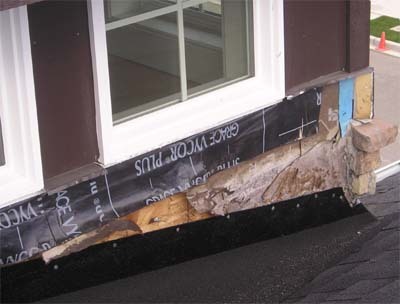 Removing wood debris and moisture control are simple steps to preserve the integrity of all homes. Someone had to notice these glaring flaws, but either the plumber, heating contractor, insulation crew, vapor barrier installation crew or all of them had the attitude "not my problem" and moved on to the next house in this large development. Read the letter from this customer and how the contractor fixed the issues we found. Most of the problems we find in home are hidden or ones not recognized by the home owner. 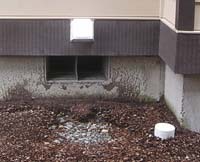 This home buyer had a leak on the roof covered under their warranty. The builder repaired the leaking valley but He NEVER FINISHED! The siding, trim, flashing and stone work at the corner weren't completed. I was shocked to see this repair, and the owner was too. To make matters worse, during the repair, they removed the downspout. The only way to see this work was to climb up on the 2nd story roof, she had no idea that her home was left in this condition. This is all too common, making shoddy warranty repairs especially in areas where a homeowner will not see the work since the cost is coming our of the builders pocket. She was told the repairs were all done, do they look complete to you? If this were not repaired soon, the warranty would have expired and there would be significant damage to the home in the first driving rainstorm. The builder agreed to make the repairs right away. the gutter contractor never installed one! 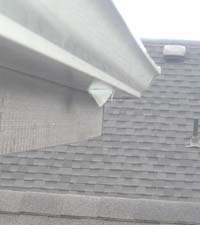 Everyone recognized that there was a need for a proper gutter and downspout. This sub was in such a hurry that it was missed. The result? Erosion, water splashing up on the side of the house and a conducive condition for structural pests. 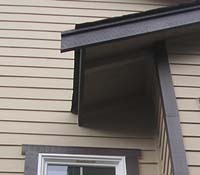 You would think that buying a house for more then $600,000 would come with complete gutters as designed, but not this time! Don't let your new home warranty expire without a thorough inspection!